You ever notice that camping becomes more of a hassle as time goes on? That’s because you’ve got more gear, more belongings, and a more labor intensive maintenance method to upkeep those items. It gets exhausting, and by the time you leave at the end of the weekend, you sit back and wonder if you ever actually relaxed. Minimalist campers know what’s going on. Not only are you saving a ton of time with preparation and setting up your campsite, but you save money, enjoy your outdoor time more, and endure far less stress than the way you’ve been carrying on. You can adopt these ideals with your family, friends, and even start teaching the little ones about minimalist camping. Let’s talk about the ideals that define minimalist camping, and then proceed on imbuing it into our own lives. This is in the title of minimalism, but it’s easy to hear one fact about something and assume we know what it is. When minimalist campers only pack the essentials, we mean that they have everything they need in a 22L backpack, and they’re not just staying for one night. Even if you think you know what minimalist camping is, they actually take it to a whole new level. If you’ve checked out our guide on packing your external frame backpack, then you know that you have to organize your belongings before you pack them. If the answer is no, then it’s not going with you. This is going to apply to every other ideal we’ve listed here, so it’s important to know as a foundation. A true minimalist enjoys the feeling of being lightweight and fancy free far more than having a minor convenience. When you become a minimalist camper, you’re doing more than just taking less gear with you; you’re taking less stress with you. The main misconception is that minimalism means you’re not prepared for worst-case scenarios, but nothing could be farther from the truth. 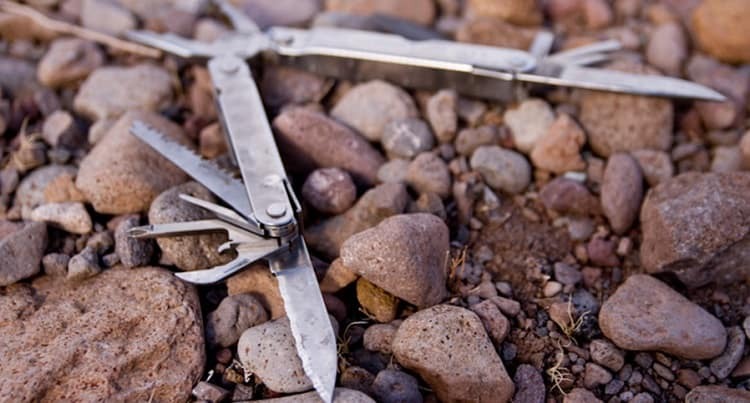 Minimalists know how to get more done with less, and spend a lot of time weighing the different benefits of various multitools. 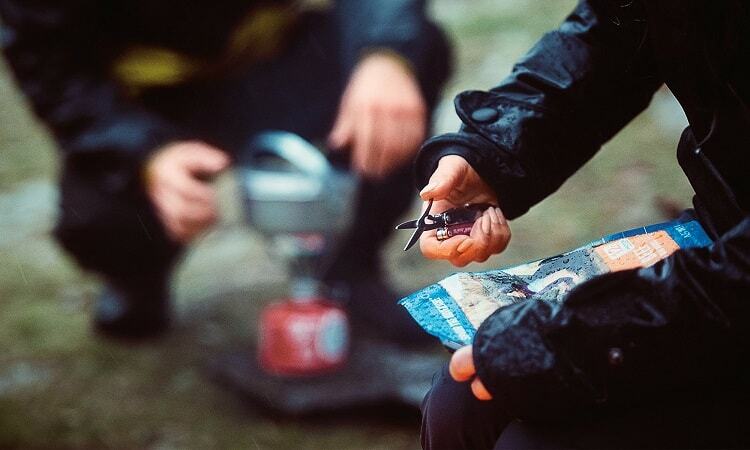 Minimalist campers are usually more in-the-know about brand-specific gear, knives, and other tools, because they’re looking to have the highest quality items in their small kit. Quality trumps quantity for a minimalist. That being said, they carry higher quality headlamps with a bigger lumen output, sharper knives with better finishes, and more durable, multifaceted camping watches that serve a variety of purposes. It’s about being outfitted with less of an outfit, so to speak. While it’s not often talked about, your clothing and its storage compartments also play into being a minimalist. Jackets with multiple pockets, hidden zipper slots along the interior, knife sheaths in their boots, anything to minimize the amount of external bags that they’ll need. The more you can comfortably keep on you, without weighing yourself down, the more prepared you are for everything ahead of you. Keep in mind that this is a make or break for some people, but minimalists will opt to stargaze under the light cover of a tarp over a tent. 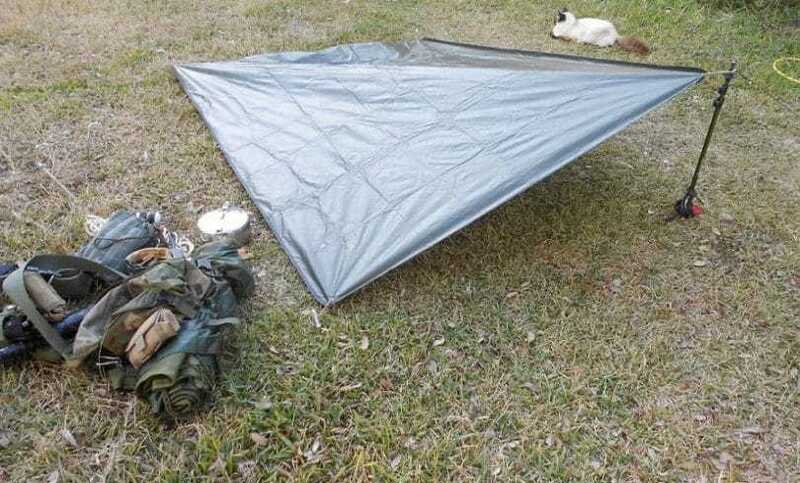 The obvious benefits of this are lighter packing, but until you actually throw a tarp in your backpack instead of a tent, you have no idea how much lighter everything is. Even when you go with an ultralight tent (which we’ll be talking about in just a minute), a tarp is still a lighter option. The goal is rain protection and a bit of shade in the hotter months. You don’t want to go camping without some form of shelter, and most tarps only run between 1.5 lbs and 3.0 lbs, whereas a tent can easily triple those numbers and still feel snug. This is one of the biggest and often most difficult adaptations to the minimalist mindset on camping, but comes with major benefits when you actually throw the bag over your shoulders. We just talked about ultralight tents, but you’ll find ultralight in the title of a ton of different minimalist camping gear. It’s the one word that they want to hear more than anything else, but don’t be deceived by clever marketing tactics. There’s tons of inconsistent information available online, sometimes even on product listings, so it’s important to look at user reviews and get some first-hand information before siding with an ultralight version of anything. The trick with these items is that brands don’t want to lose money, but they’re technically giving you thinner, lighter products, and that takes some engineering to figure out. Reasonably, you should assume a high quality product that will stand the test of time, but it will require a bit of extra deep-diving on different products (or you can use the buying guides we’ve developed). Ultralight items usually come in higher grade materials than their heavier counterparts. For instance, nylon is one of the strongest materials you can get for an ultralight tent. It’s stronger than poly materials, even if they are the same grade. You’ll commonly see grades of 60D – 600D ripstop on different materials. The “D” stands for denier, and the higher the rating, the more durable the ultralight item will be. This applies to tents, jackets, sleeping bags, backpacks, and more. 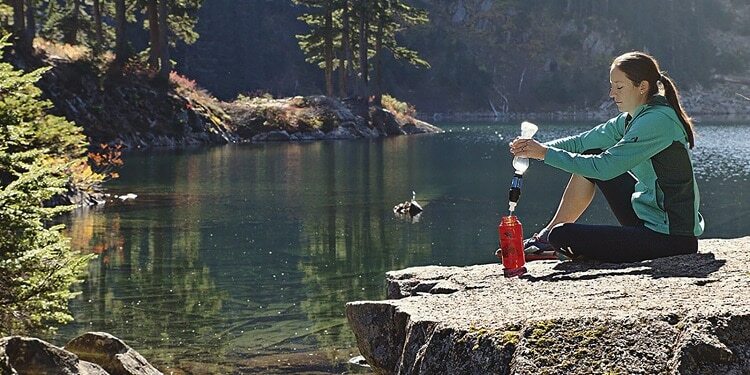 If you have a highly rated portable water filtration system, then you don’t have to worry about bringing heavyweight water bottles with you. If you’re intaking the daily recommended amount of 64 oz (half-gallon) of water every single day, you’ll likely have to double that when you factor in the efforts of hiking, lugging your backpack, setting up your tent, and everything else associated with your campsite. To put it in perspective, if you take two separate one-gallon water jugs with you for a two-day trip, assuming that you have one per day, you’re carrying an extra 16 lbs of weight. Compare that to a 5 oz LifeStraw system, or even a 4 lb gravity-fed filter system, and the difference is staggering. Not only that, but minimalists, by nature, don’t like to be wasteful. They will take every approach possible to prevent wasting materials, so the thought of all those plastic bottles and jugs is a real turn-off for them. Water filters last for thousands of gallons of water, and provide a microscopic amount of landfill waste compared to disposable containers. This is a quick one, but the idea of minimalism camping is to fit as many functions as possible into as few quality tools imaginable. The more function your Swiss Army Knife has, the better, but don’t be jaded: quality matters here more than anything else. Opting for a low-end multitool means that if it breaks on you during use, you’re not just down one tool: you’re down half-a-dozen or more. They’re the ultimate accessory, just be careful what you’re buying. Propane lanterns are old-school, but not necessarily a good thing. Then you get into LED lanterns with solar panels on top, but even then, it’s still additional carry weight. Apart from the tactical flashlight or headlamp they keep in their survival EDC kit, most minimalists prefer to live by moonlight and the glow of the campfire instead of lugging around bulky, heavy lamps. Camping gets less and less authentic when you exclusively bring canned or dried food, bottled water, and Duraflame logs from the convenience store on the outskirts of the campground. Living off the land is a minimalists ideal for multiple reasons, but primarily, you’re not going to lug a bunch of extra supplies with you into the woods. Less carry weight coming in means a faster campsite setup time, and relatively zero fatigue when you drop your bag down. If you’re going onto campsites that require a daily fee, you’re going to be met with some restrictions. It depends on the national park or private campground, but dispersed camping offers fewer restrictions when it comes to gathering food and kindle, among other outdoor resources. Minimalists let go of everything they can, everything that doesn’t immediately benefit them or aid them in the long-term game, and with those ideals in mind they prefer dispersed camping over the restrictions of campgrounds. Can You be a Minimalist on a Campground? There are some issues when it comes to campgrounds. Minimalists, as we mentioned before, prefer to live off the land as much as possible. They prefer not to rely on nearby superstores, convenience shops, and as you might imagine, they don’t particularly care for daily amenity charges. One major driving force of being a minimalist in anything you do, is saving money while simultaneously having everything you need. Minimalism is about being nomadic, and without putting a label on them, you’ll find that the majority of minimalists leave their campground in pristine condition when they depart, leaving no trace at all. Campgrounds are the opposite of that: RV exhaust, noise pollution during the summer months, and generally, people who disregard no littering rules and leave the place looking in chaos. You can be a minimalist on a campground, but it’s not the ideal circumstance. Campgrounds offer amenities, activities, and take the fun out of camping for a minimalist. Living off the land, catching your own fish, gathering your own firewood, setting up a true camp, all of the above: that’s what they live for. But when it comes to gear, minimalism is all about being picky, and doing your homework. A minimalist camper will choose function over comfort every single time. Tarps over tents, sleeping pads over sleeping bags, everything else that we’ve talked about previously in this guide. If you’re enticed by minimalism on the campsite, ask yourself these questions when you’re packing up, and see if you’re meeting the criteria, or if you need to cut down even more unnecessary items. Do I need this to survive in a worst-case scenario? If the answer is yes, then it’s coming with you. However, if you can combine one survival item into another (such as a compass and fire starter into a combined paracord survival bracelet), this is the ideal way to approach this situation. Does this serve more than one function? Not every item you have will be immediately multifunctional, but the majority of them should be. Look for multitools, added bonuses to clothing and backpacks, and never box yourself in to the primary function that the product was made for. Use your creativity; you’ll have it in bulk supply. How often am I going to use this? Perhaps once on a three-day trip? Is it really necessary, or is it just convenient? Instead of lugging that huge can opener with you, find a Swiss Army Knife with a smaller, and albeit slower manual can opener. This is just an example of course, but the idea can carry across every category of your camping equipment. Will this add too much to my carry weight? Nine times out of ten, there’s a lighter option for that sleeping bag you’re carrying, or the empty weight on your external frame backpack. We talked about ultralight being the buzzword that minimalists want to here, and it applies to weight as well. If the item adds to much to your carry weight, consider switching it out for a hybrid solution. If it can’t be replaced, then look to minimize your carry weight in other pieces of gear, and compromise. How durable and reliable is this tool/item? You’re relying on less, and expecting it to perform more. There’s nothing wrong with that, so long as you’re kitted with the necessary tools of a higher caliber than standard discount shelf camping equipment. Look at everything you’re bringing with you on its most basic level. Added conveniences are nice, but by nature they’re not a requirement. Try not to utilize items that require electricity, or consider bringing a miniature solar panel with you to recharge them, such as a USB-charged tactical flashlight. Picking the right gear is hard, but we make it a little bit easier. It depends on what you need, but we’re willing to bet that we’ve already compiled what you’re looking for into one of our many guides. 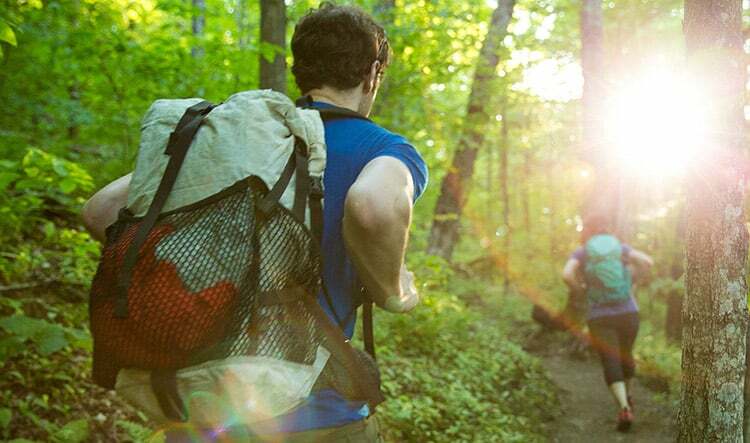 Check out our buying guides for information and excellent gear to accompany you on your next trek into the woods, and remember to pack light.